The MUD FLAPTM helps keep the wire free from "Shop Dirt, Grinding Dust, Weld Spatter, etc. The "MUD FLAP, (part number WAT-MFLP) is 3 1/2 inches wide by 37 inches long. It can fit most wire feeders by placing the strip of self adhesive Velcro supplied on most feeder covers. 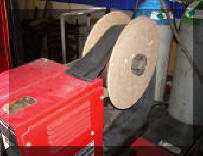 A Velcro strip is sewn on the FLAP and simply attached to the one installed on the feeder. The MUD FLAP simply rests and covers the wire on the spool or coil. As the spool turns and feeds wire from the bottom, the MUD FLAP simple rides along the top. The MUD FLAP will even work on feeders where the wire spool or coil is at a 15 degree angle as shown in the photo on the right. Feeders like those shown at Right use a "connecting belt" (supplied) that attaches to the feeder and then the MUD FLAP. (email for details). Note; ESAB is a trademark of ESAB Welding & Cutting Products; Lincoln is a trademark of The Lincoln Electric Company and Miller is a trademark of ITW, Inc.